Across the lawn you see a bustle of well-dressed ladies and gentlemen drinking Pimms and laughing beneath the gazebo. You hear the distinct clack of a mallet against a ball as the players on their polo steeds charge across the pitch in pursuit of victory. There’s nothing quite like a day out at polo. There’s just something very quintessentially ‘English’ about it, isn’t there? If you’ve never been before, we recommend you do. In fact, we’d love you to come along and join us at a very special event happening on Sunday 29th July. Here at Rapid Accommodation you know we like to go the extra mile in everything we do for our clients. And that’s never more the case than when we’re able to help raise money for charity. It’s why we’re excited to be sponsoring this years Ladies’ Day at the White Rose Polo Club. The annual event is being held in aid of Prostate Cancer UK, which we’re sure you’ll agree is a great cause. To help raise money, as well as being able to watch some exiting ladies polo in beautiful grounds, you’ll also find luxury retail stalls, a champagne bar, cocktails, delicious posh nosh and picnics. Plus you’ll be able to dust off your best outfit for our best-dressed lady competition. 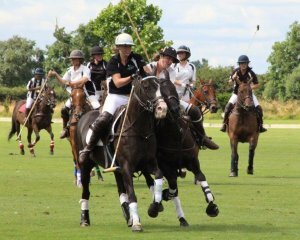 It’s being held on Sunday 29th July at the White Rose Polo Club at Townend Farm in North Cliffe, YO43 4XB which is just a few miles outside York. It’s a stunning location and you’re sure to have a wonderful day out. Just £15 gets you a ticket, which includes entry, pitch-side parking, an exclusive rosette and even a glass of fizz on arrival. Best of it is: if you’re quick to book for five or more before the 22nd, they’ll even knock a fiver off the ticket price, so you and your friends will only pay £10. Children go free. Guests are allowed to bring their own chairs or gazebos to relax at the pitch side, and if you’d rather avoid packing your own picnic, you can pre-book traditional afternoon tea with sandwiches, cakes and scones. All you need to do to book tickets and find out more is contact Claudia at the Polo Office on 01430 8757676. We suggest you do so today to secure a spot. We can’t wait. It promises to be a fantastic day out and all for a good cause.